Sonic Mania takes some of the best samples/examples of the 16-bit Sonic games on the Mega Drive/Mega CD and mixes them up to be one of the best Sonic game in years. NOTE: We try to keep our reviews as spoiler-free as possible, though there is a chance some minor spoilers may be mentioned in this review. But I promise not to give away the game’s ending or any major spoilers. After a good year of build-up, with hands-on previews at countless gaming events and shows, Sonic Mania is finally here, and it couldn’t have come sooner because I’ve gone nearly braindead playing rounds of Sonic 06 and Sonic Boom lately. But will Sonic’s return to its 16-bit roots be a positive outcome the franchise has been yearning for, for years? Let’s find out! From the moment you boot up Sonic Mania, you feel as though you’re back in the mid-’90s with an excellent sprite-based ‘3D effect’ of a rotating island and Sonic sitting in his usual title screen emblem. If you leave Sonic floating there for a few seconds, you’re treated to a nifty animated intro (created by Sonic Comic artist, Tyson Hesse), similar to the old Adventures of Sonic The Hedgehog cartoon series. This opening intro isn’t a cutscene – it doesn’t have any voice over work or tell a coherent story – it’s more of a subtle and very fun introduction for the game, presenting the main characters and giving a nod to the storyline. As for the story, Sonic Mania is set immediately after the events in Sonic 3 & Knuckles. After saving Angel Island, Knuckles is now firmly on your side and all is good with the world, when suddenly Tails picks up an energy reading. But Dr. Eggman has also detected the energy reading and sends a new team of Egg-Robos known as the ‘Hard-Boiled Heavies’ to reach the source of the signal first. With Eggman up to no good, it’s up to Sonic, Tails and Knuckles to stop him. Jumping into the game, everything about the 16-bit era flows back, as you are treated to a beautiful, pixilated experience almost exactly like the Mega Drive originals. Unlike Sonic 4, SEGA hasn’t opted for smooth, up-to-date graphics and fancy animations, everything about Sonic Mania exudes ‘retro’ – even the few moments where 3D polygons are used, they are created in a way that it looks like a Mega Drive game. But of course, Sonic Mania isn’t a 16-bit game; while the visuals maintain their retro appearance, there are moments of ‘flair’, such as transparency and subtle depth of fields that were too complex for a 16-bit machine to handle effectively – even with blast processing. 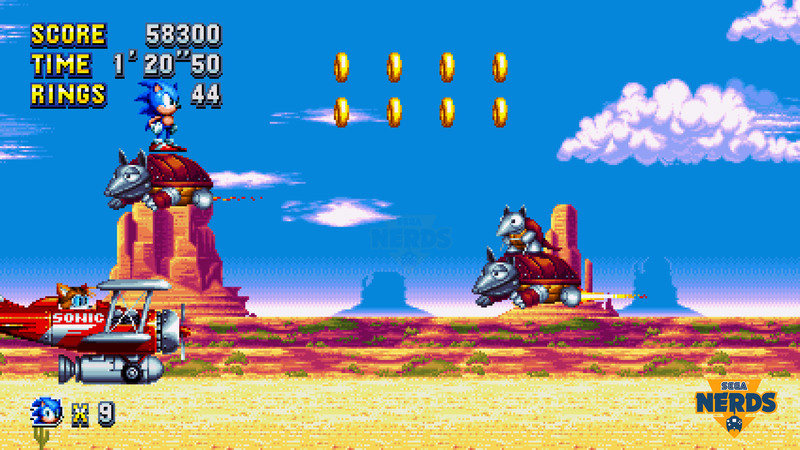 These moments of flair are often very subtle during main levels, such as occasionally seeing the odd ring bounce to the fore/background after being hit by an enemy, but they are prevalent during boss battles, with the use of foreground and background objects in play. Now, regardless of visuals, what really makes a Sonic game is the gameplay. It’s part of the reason Sonic became a firm favourite with many gamers and a genuine rival for Nintendo’s Super Mario series. 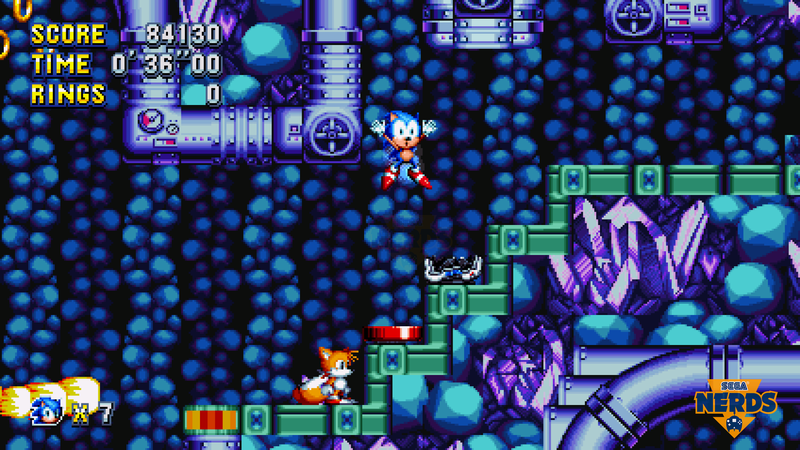 Sonic The Hedgehog was fresh, fast and offered a unique platforming gameplay experience unlike any other game at the time. ‘Classic Sonic’ is pure: it’s a combination of well thought-out platforming brilliance, combined with the flow of a fast game of pinball. While ‘Modern Sonic’ is a mixture of balls-to-the-wall, (virtually uncontrollable) speed and (often unnecessary) gameplay mechanics interweaved into a story line – some people like it, but it’s not for everyone. Sonic Mania takes the simplicity and purity of Classic Sonic and does very little to change it, which is great. You have no lock-on attack, no additional moves or gimmicks to get in the way of reaching your end-level goals and beating Robotnik. Returning to retro Sonic gameplay can take some getting used to, but once you get your groove going, everything comes together to make a wonderfully fluid experience. Wait, this is Classic Sonic! If Sonic Generations paid homage to every main Sonic game over the past 20 years or so (both 2D and 3D), Sonic Mania is a homage purely to the 2D classics. 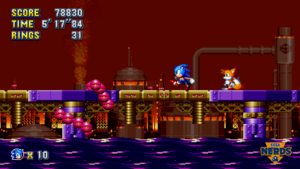 There’s so much fan service that at times it feels like a re-release of early Sonic games, with nods to each of the Mega Drive originals at every turn – awesome little details, such as the birds and fish from Sonic 1‘s special stage, featuring in Mania’s special stage. While the game does feature entirely new zones, it also features remakes of classic zones from Sonic 1, 2, 3, Sonic & Knuckles and Sonic CD – fan favourites that are synonymous with Sonic, such as Green Hill, Chemical Plant, Flying Battery, Stardust Speedway, among others. 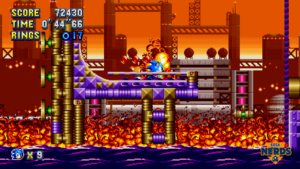 At times, you feel like you are playing the original games, but then Mania will throw in some massive curve balls that totally change everything – such as new enemies, boss battles or entirely new sections and mechanics to a level, such as the springy goo in Chemical Plant Zone. It’s really fun to reminisce over old levels, but have them feel fresh at the same time and I applaud the developers for this. On the boss battles, these are great fun in Mania. The bosses that are similar to the old Sonic titles have been changed up enough to feel fresh. The brand new bosses are great, making good use of the modern technology to add some subtle visual or gameplay enhancements to make them exciting. As with other Sonic games, Sonic Mania’s soundtrack is superb. 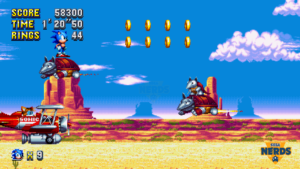 The old music in the game is remixed slightly, with zone remakes feature the same excellent soundtrack, while new levels feature appropriately original scores – which are catchy and in-keeping with Sonic. 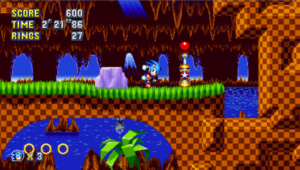 For the most part, the new levels are awesome, keeping the flow of the game going, with some very fun settings and unique elements to each level that makes them stand out – such as one zone where Sonic shrinks and looks like a baby Sonic; standing next to badniks, he looks hilarious and added something new to the game. Sonic Mania’s special stage is one of my favourite additions to the game, though I can imagine that not everyone will enjoy them as much. 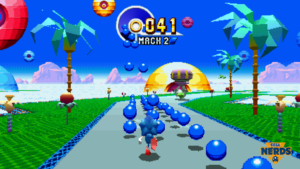 Sonic runs around a flat quasi-3D environment, similar to those in Sonic CD (or Mario Kart on the SNES, if you will), as you chase after a UFO carrying a Chaos Emerald, against a time limit. To catch the UFO, you need to collect blue balls, to build up Sonic’s speed, while collecting rings will boost the precious time limit. These special stages are really fun and, while can offer a challenge, never feel unfairly taxing. 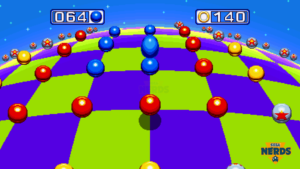 However, finding them is a different story – as the entry points, which are giant rings, are hidden throughout the levels (some levels have multiple rings to find) and that can be a problem for first-time players. 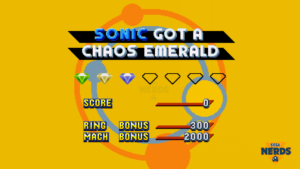 I only got four of the Chaos Emeralds on my first playthrough, simply because I couldn’t find the rings in the levels! But that’s the beauty of Sonic games, replaying the games over and over lets you explore and find the secret areas or new routes to get the best times in each zone. One negative about the special stages is that the draw distance is pretty poor. It doesn’t actually hamper the gameplay at all, but watching back my gameplay clips, it’s much more obvious. It’s a shame, I feel the developers could have maintained the 16-bit visuals, while using the power of modern consoles to remove these old hardware-limited problems we used to have in the 90s, such as pop-up. 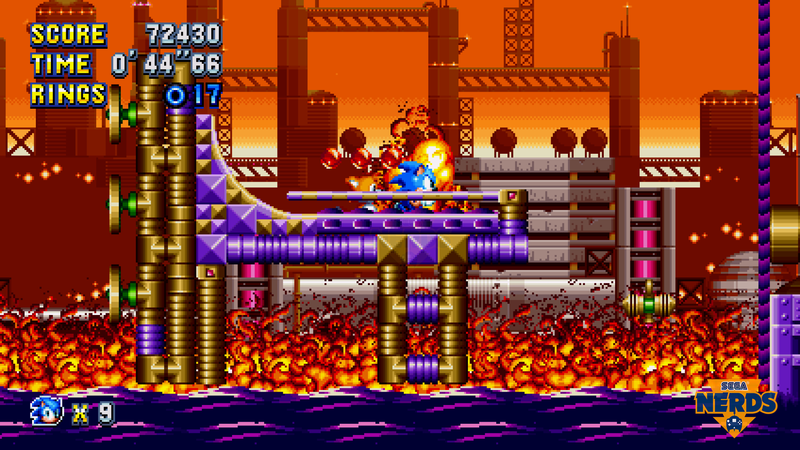 Mania has also added new mechanics to already established pickups – such as the fire shield being able to burn things, such as wood and oil. As you progress, you unlock new gameplay modes, such as Time Attack and Competition (2-player vs) Mode. There’s additional abilities to unlock, such as Sonic’s Peel Out move from Sonic CD – which you need to select in the options menu after unlocking to activate them, so you can play through without these new abilities. At times, I found Sonic Mania weirdly hard, but I think it’s because I’ve become so unaccustomed to playing games that require skill to complete, and I was struggling in the early levels. Modern Sonic titles have so many moments where the game basically plays itself and the lock-on attack means that you can just continuously tap jump and you’ll kill everything on screen and bounce off the nearest spring pad: the skill has been removed. But Sonic Mania takes you back, it makes you work for your success. I had a ‘Game Over’ early on, too early really, I’m ashamed to say. But once I got back into the flow, I progressed through the game without any more Game Overs – though plenty of deaths. The good news here is that, like Sonic 3 & Knuckles, Sonic Mania offers save files, so you can pick up from where you left off, should you find yourself struggling at any point. There’s also the bonus stages (not special stages, bonus stages), which felt incredibly difficult. The bonus stages are the same as Sonic 3 & Knuckles’ special stages – where you run around a big 3D ball, collecting blue balls and rings, while avoiding any red balls: touching a red ball instantly ends the stage and when you touch a blue ball it turns red. Now, not one to boast usually, but I was pretty darn good at Sonic & Knuckles’ special stages – my friend and I played the crap out of them over and over (using the S&K lock-on with non-Sonic Mega Drive games). 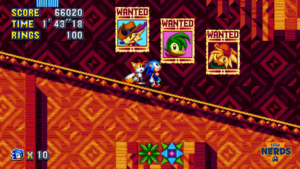 So, I was super happy to see this return in Mania… until about the 6th or 7th time, when suddenly they became really hard. Using an Xbox One controller probably didn’t help as the d-pad is rather ‘spongy’ and the analogue stick isn’t designed for the precise turns that you need to pull off. But halfway through the game, I found I no longer enjoyed these stages like I once did, often feeling cheated when I lost at the stage. Completing the bonus stage will either earn you a silver or a gold medal. Silver when you only collect the blue balls and gold when you collect all the rings and the blue balls. To be honest, I have no idea what the medals did (there’s no manual) – though, as mentioned, you do unlock new abilities and game modes, so maybe they unlock those (I’ve asked SEGA to confirm). 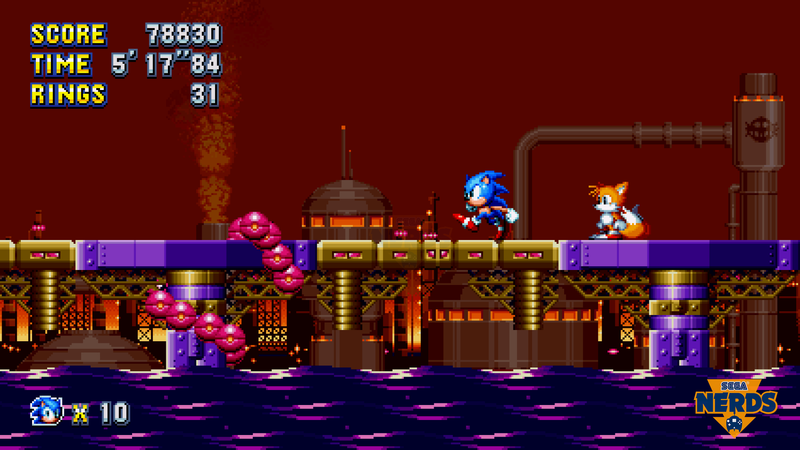 Unfortunately, unlike Sonic 3 & Knuckles there aren’t any other bonus stages. 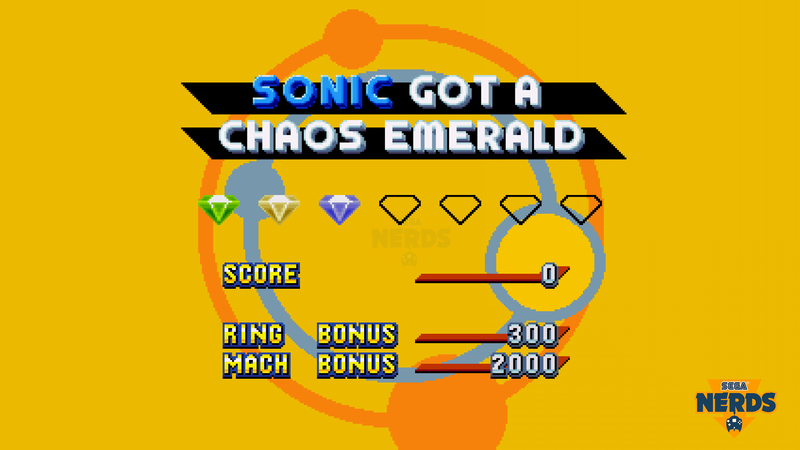 For me, this wasn’t too much of a deal breaker, but I know some people really enjoyed the various bonus stages that could be accessed via a checkpoint, depending on how many rings you had collected. Putting aside from my diminished Sonic gaming skills, I did find that Sonic Mania had more unfair deaths than I’d ever experienced in a Sonic game. There were times where the game would literally force you into enemies/traps, with no control or ability to avoid them. I also found some of the levels took far longer than previous entries. That wouldn’t be a bad thing, except Sonic games have a time limit; as soon as you hit 9 mins 59 secs on a level, you die, due to time out. 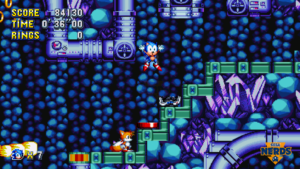 I have only ever had this happen to me once on Sonic 1, when I was exploring a level, trying to find different paths. But it’s never happened to me since… until Sonic Mania, where I managed to get time outs three times in a single play through. 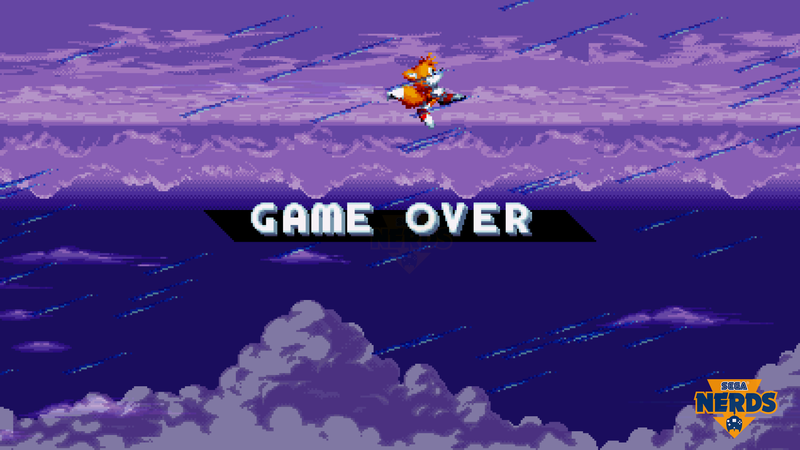 One of them was because Tails kept screwing up in a boss battle (he kept jumping on something when he wasn’t meant to, meaning I couldn’t hurt the boss) and the others because I just ran out of time. It’s weird, I didn’t feel like I was going slow, yet I ran out of time more than once. While Sonic Mania has moments of frustration, it doesn’t have any serious problems that hold it back. This is a bold statement, but Sonic Mania is the very Sonic game fans have been dying to play for years! SEGA has finally done the right thing, removed all the nonsense of Modern Sonic titles and, through Christian Whitehead and the teams at Headcannon and PagodaWest, delivered a Sonic The Hedgehog game in its purest form. Sonic Mania takes some of the best samples/examples of the 16-bit Sonic games on the Mega Drive/Mega CD and mixes them up to be one of the best Sonic game in years; bringing back the replay value and the challenge needed to complete the game fully (with all Chaos Emeralds), plus some added extras, so things don’t feel stale. However, I don’t want to say this is THE best Sonic game of all time, that’s too big a call to make – especially when the original material was so damn impressive back in the day, only hampered by the technology behind it. 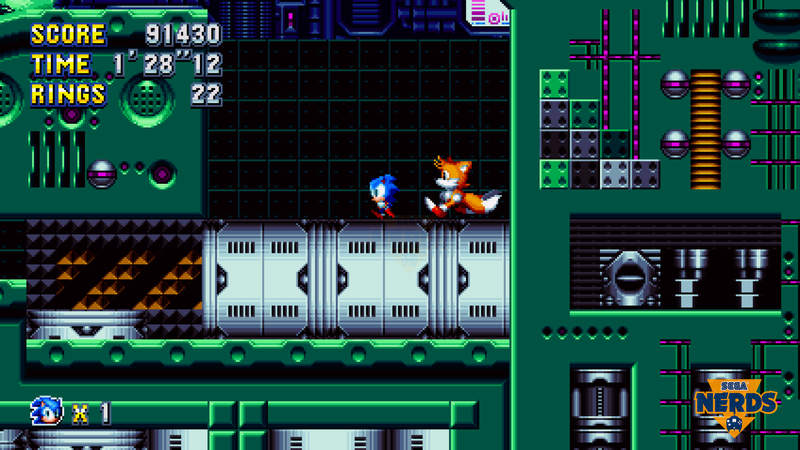 But ultimately, if you are a big fan of Classic Sonic games, then Sonic Mania is an absolute must-have. – …I wish it was still the 90s, when I was a kid and could play games like this all day, rather than work!